With spring tempting us a little more each week, and the tulip buds just beginning to show their tips, we are craving the bright happiness that flowers bring. Throughout the summer, we’ll be surrounded by gardens full of lush and colorful flowers, many maintained by the City of Chicago. One of my favorite spots to view the flowers is the park outside the Lincoln Park Conservatory, adjacent to the Lincoln Park Zoo entrance. Longing for the flowers to arrive, I recently attended the Secret Garden Flower Show, held at Macy’s on State Street. 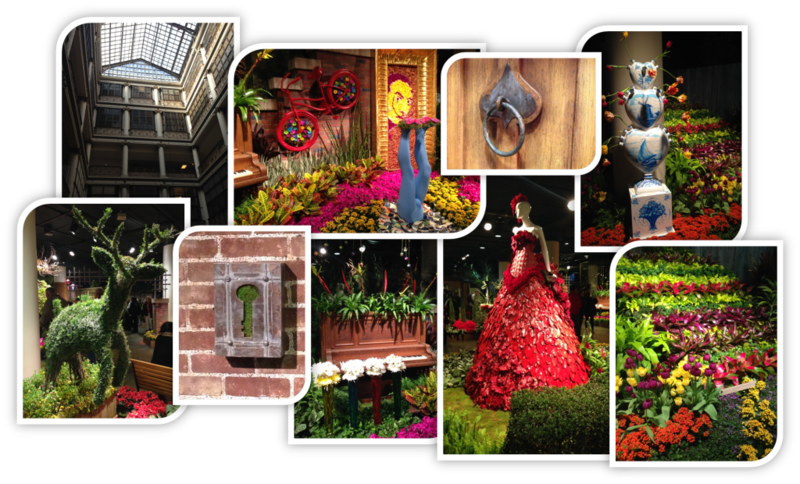 Tucked away in one of the top floors of the building, this free flower show featured blooms of all colors, shapes and sizes. 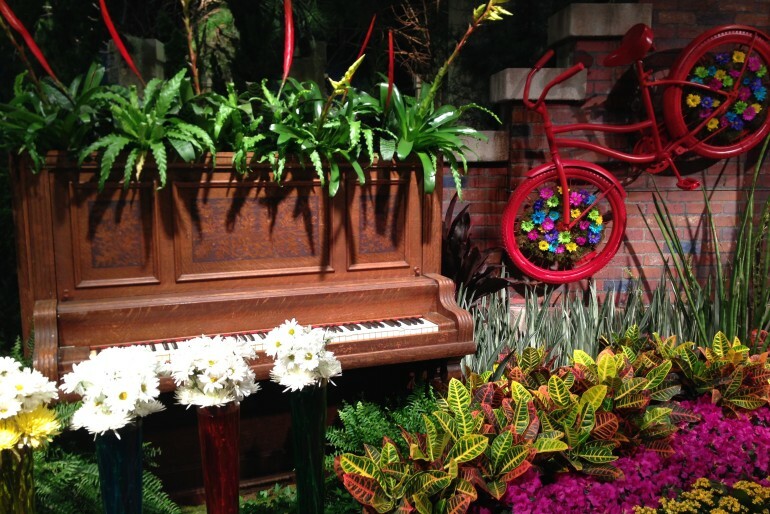 Decorative scenes were supplemented by creatively placed pianos, bicycles, painted car tires and other unusual objects. The pièce de résistance was a 10 foot tall beauty donned in a dress of bright red flowers. If you’re interested in flowers and want to get hands-on, there are multiple opportunities in Chicago. Allure Floral Design (1343 N. Ashland) is offering a 2-hour class at their shop in Wicker Park. Thanks to a LivingSocial deal, the course is only $47 (only a few weeks left to take advantage of this offer). You’ll be guided through floral fundamentals, design principles, and learn how to create your own bouquet. Spruce up your home or office with the flowers you’ll be able to take with you. Tour Lincoln Park Zoo’s beautiful gardens with the Horticulture Department to learn how they’re designed and maintained. Seasonal plants and flowers will be highlighted each month. Tours are free and occur on the second Saturday of each month from 10 – 11 a.m. Upcoming tour dates include May 10 and June 14, and begin at the Nature Boardwalk Kiosk.